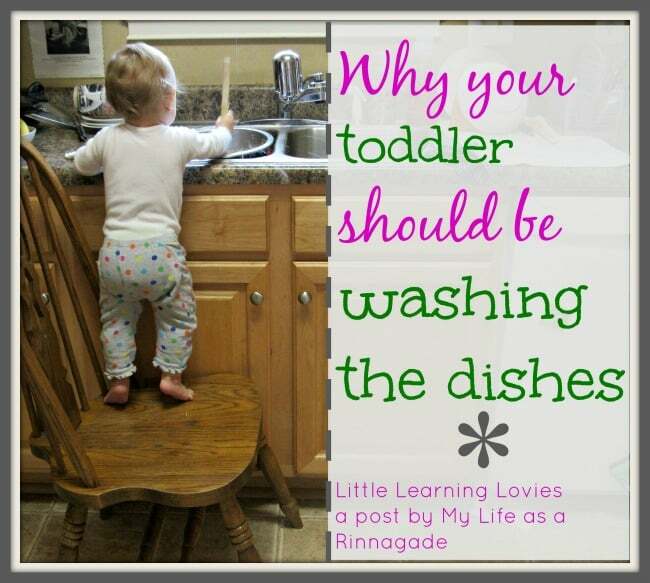 » Let Your Toddler Do The Dishes! Little Learning Lovies Contributor Cindy shares with us today how she totally rocks this Mommy gig by letting her toddler do the dishes! Will you let yours? Little miss is frequently in the kitchen with me. I joke that she’s going to know how to cook by time she’s two. As much as I love having her around, sometimes I just need to get stuff done…like that sink full of dishes. A couple of months ago, our dishwasher broke and we’re saving up for a new one. Until then, it’s me and my scrubby wand. I spend quite a bit of time in front of the sink so naturally, little miss is curious about what’s so fascinating. If she only knew ;). One day instead of trying to distract her, I decided to let her join in. So why should you let your toddler wash the dishes? Water play is great for development in children of any age! I had a friend whose dad would constantly brush him away while working on the car and then was flabbergasted when this boy grew up to be a man who didn’t know anything about cars. Really? Think about this for a minute: Would your toddler be happier in the kitchen playing with you, or in front of the TV? Which would you rather? Why not do life together – side by side, working on the same task. Okay, so you’ll be working and she’ll be playing but a child’s play IS her work! Lay down a beach towel in front of the sink and remember that children – and their clothes – are washable. Let her at anything unbreakable. At the store, they sell play dishes, but why not use our own plastic ones…for FREE?! Add soap bubbles and spatulas for extra fun. Start when they can stand and reach on a sturdy chair. It goes without saying, you should not leave them unattended. And would you believe it? I got all the dishes done with little interruption. Tell us: How do you encourage your little ones to get involved in life with you? 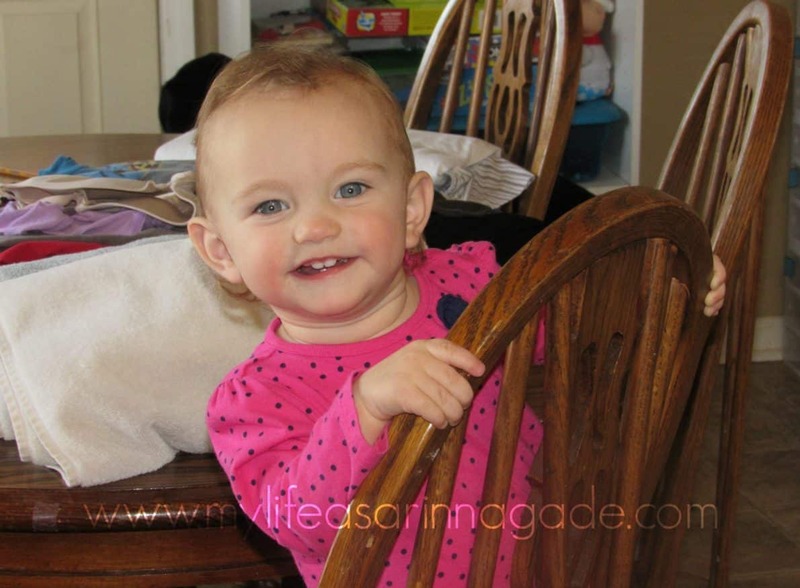 Cindy Rinna is a full-time blogger and freelance writer as well as a wife and mom of four crazy and adorable children. You can read more from Cindy on her blog, My Life as a Rinnagade where she writes about educating her children, autism, ADHD & healthy living. Connect with her on Pinterest, Facebook and Google+. Chore Systems 2 Ways… Fun Motivation for You AND Your Kids! How To Actually ENJOY Grocery Shopping With Your Kids! These are such great tips! I had my children clearing their own dishes from the table as soon as they could walk. My 2 1/2 year old scrapes her own plate into the trash. Allowing them to help while they are little is so important. Although my kids are not toddlers, they’re older, I enjoyed letting both of my boys help with dishes at that age. Now they both know how to cook lots of things. Little Miss is so cute! You have adorable children and your tips on raising parents is dully noted. I am an elementary school teacher and I appreciate you instilling good work ethic into your kids at an early age and engaging them in “fun learning experiences” instead of taking the easy way out and giving them the screen. Thank you, Ryan! It is an uphill battle with screens being so much a part of every day life, but I do try to limit them as much as I can and focus on people instead of things. Thanks for reading and commenting!